Columbia Interactive is the gateway to selected electronic learning resources developed at Columbia University. The database of digital content is divided into various sections on the basis of the type of contribution: faculty interviews, learning tools, semester-length e-courses, and more than 100 shorter e-seminars. All content is free only to Columbia students, faculty, staff, while it is available to the general public through fee-based and licensing arrangements. The content is grouped into 16 subject areas each with its own organisation, depending on the material available. 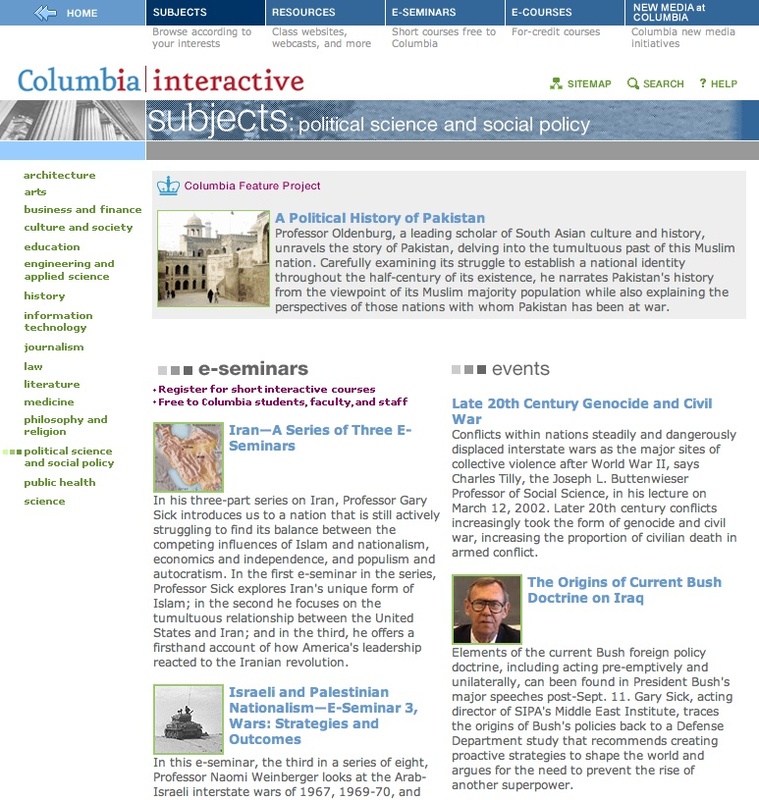 The culture and society section covers 28 events, while the political science and social policy section includes a variety of different learning tools, faculty interviews, journals and newsletters as well as the 50 e-seminars and more than 100 events, such as The World Leaders Forum and the annual Events of the School of International and Public Affairs (SIPA). The contributions are individually recorded and updated in real time format and all videos are available with a short description of the lecture and photo of the lecturer, but none can be directly downloaded. Seminars have a brief presentation video and an introduction by the speaker, and there is a reading list for the seminar. Search is essentially by subject, advanced search and archive. This section deals with the multimedia developments in scholarly environment: lessons, lectures, seminars in video format.